War of the Worlds: Aftermath is a novel written by Tony Wright that expands on the novel by HG Wells. The original War of the Worlds was first published in 1898, 113 years ago and told the story of the alien invasion of Earth - narrated from the first person perspective of a philosophical writer who witnesses this invasion while struggling to reunite with his wife. 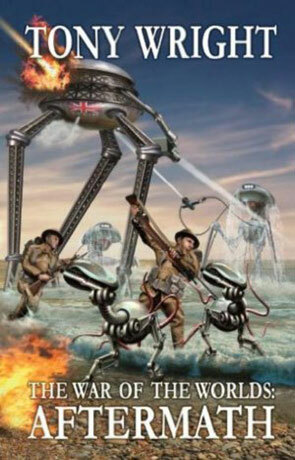 It's very much the everyday man's view of an invasion, an original vision which broke new ground in the genre. It's also one of those few novels that managed to break out of it's genre, it's since become an iconic classic and has been adapted in many forms including George Orwell's Radio adaption, Jeff Wayne's Musical and a fairly recent film starring Tom Cruise - directed by Steven Speilberg. War of the Worlds: Aftermath has been written by Tony Wright as an unofficial sequel of sorts, a fanmade work that has been created to pay homage to Well's original vision while at the same time expanding upon some of the many ideas. Most of the canon has been left intact with the exception of the speed of the aliens (or Martian's as that's where they originate from). In the original novel due to the slight Mars gravity the Martians had great difficulty in moving around on Earth. In this novel creative licence has meant they are now very fast and very strong. Does this matter? to a real purist maybe, but I think the reason that this was changed was a perfectly valid one (dramatic licence) and only add's to the novel's value. As with the original, this is narrated in the first person, and by the same survivor, while the story begins just a few months later. To start with the style is broadly similar and the character very much like he appeared previously however as the story progresses this does change somewhat and as the plot becomes more action orientated, the character becomes more hero like. In a way this departure strengthens the story and allows the writer room to breathe and instil his own voice. Over a century has passed between books and as you would expect there are many natural differences (as the world itself is a very different place) - the author here uses the topical subject of terrorism to explore the story further and for the most part it works well. The prose is fairly uncomplicated and easy reading while the plot has plenty to keep the interest going. Personally I would have liked to see the story told from a different perspective but that would be another book. War of the Worlds: Aftermath isn't going to set the world on fire like the original did but as a fan made piece of literature that pays homage to a classic it works very well and most readers of HG Well's classic should really like this book. Written on 14th March 2011 by Ant.